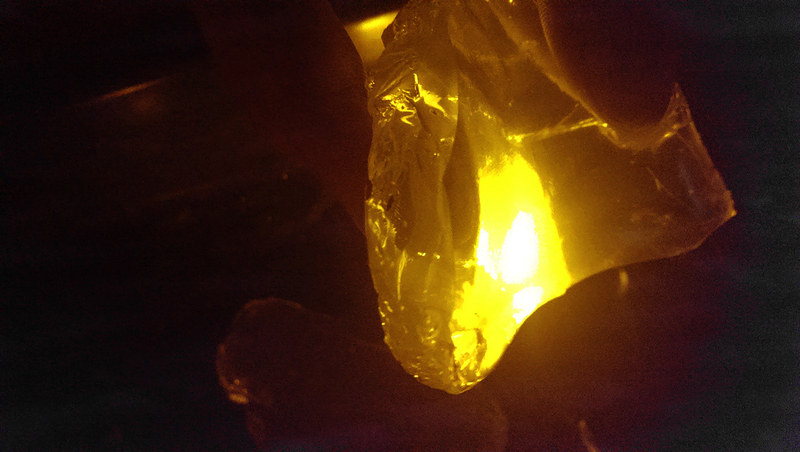 Objective: To make//find an aesthetically pleasing, translucent material – both hard, “glass-like” and flexible – latex-like in its properties. Can be used decoratively, like lacquered onto sculpture or poured into moulds as a potential resin replacement, or used as sheets for projection – projecting on or projecting through. Again, the filter of the filter. 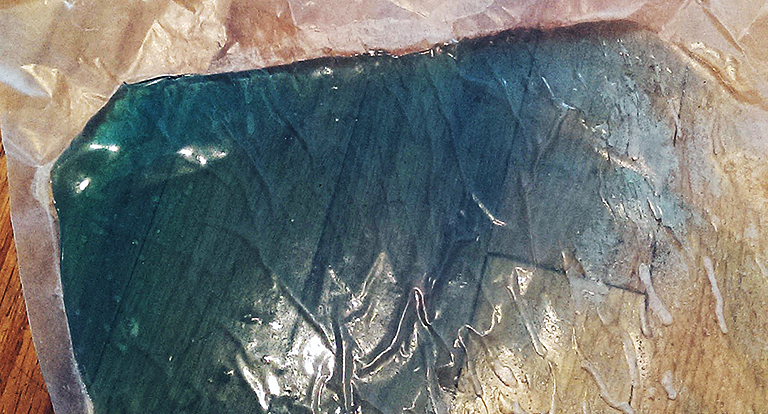 Also experimenting with colour – natural versus unnatural, stained glass hues. Most importantly, the bio-material must be durable, strong and inexpensive. 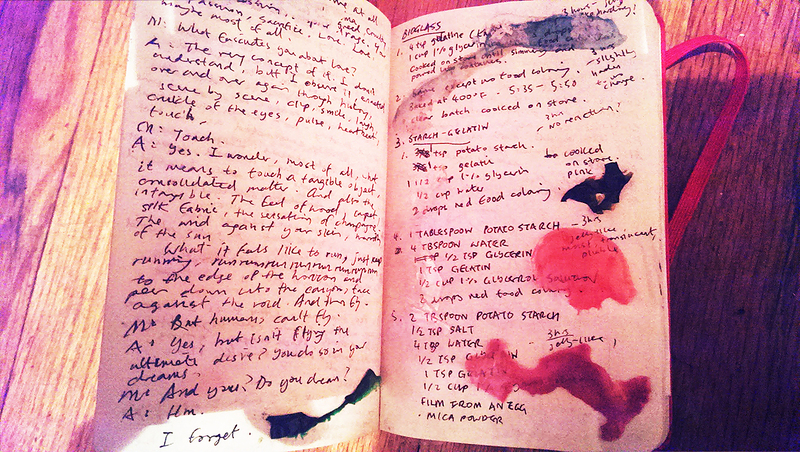 Some of my initial tests above ended up cracking – very brittle (like my life, haha jokes). So I decided to crush them into rock-like fragments that I thought could live life as interesting crystal fragments or re-constituted as another material. The flat colourless sheets were super wrinkled but were quite durable and translucent. 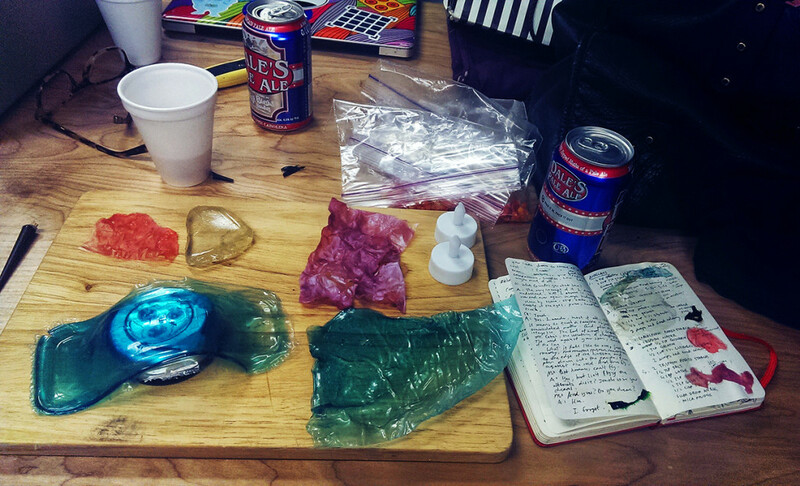 With the help of the Green Plastics book, I decided to attempt to make bio-glass and bio-latex. Let’s just say that the first was a failure in the sense that I never made anything hard enough to be constituted as glass. The main issue is that it is so hot and humid and it takes so long for the plastic to dry that it begins to mould, so I have to throw it away before it gets to the final stages. However, with these experiments there was little shrinking and with the flat sheets, no cracking at all. In fact, I managed to create a series of different sheets of bio-latex like material that could be used interestingly in a variety of artistic applications. For this recipe i mixed all the ingredients thoroughly before turning on the heat and cooking the plastic on the stove until simmering, then poured (like liquid) into containers or spread on foil. 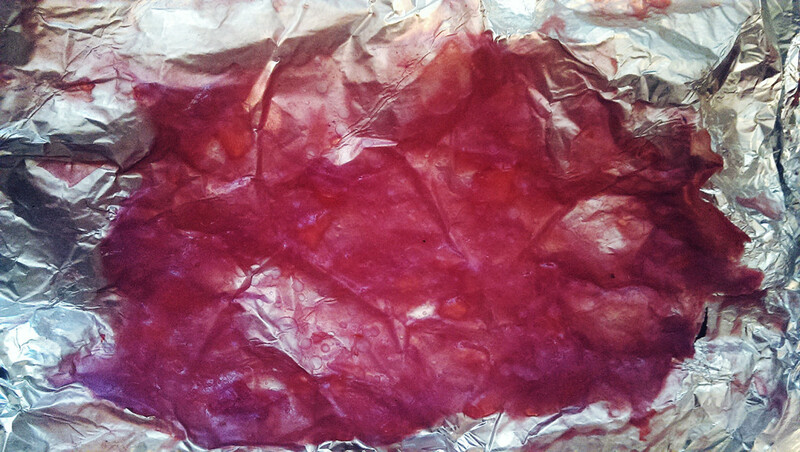 After 3 hours, it was jelly like and hardening. 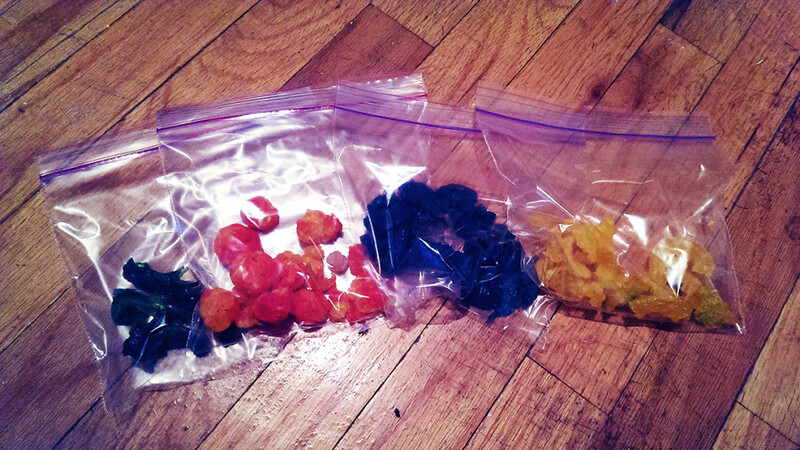 I also baked a quarter of the same batch with no food coloring at 400 degrees F for about 15 minutes. After 3 hours there was little to no change except a slight jellification (is that an actual word). 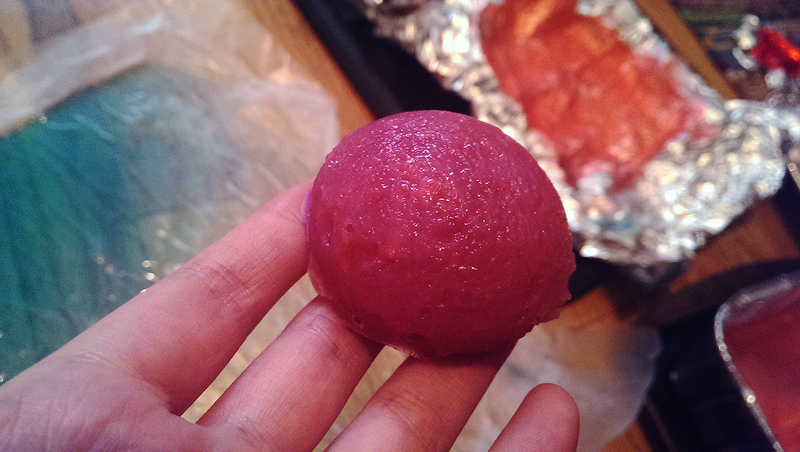 I cooked this again on the stove (it turned pink). 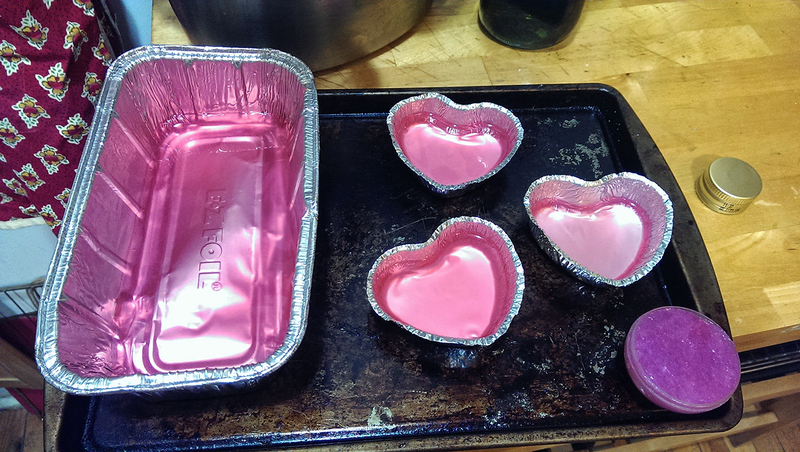 After 3 hours there was absolutely no reaction… still completely liquid-like. So I decided to add more potato starch. 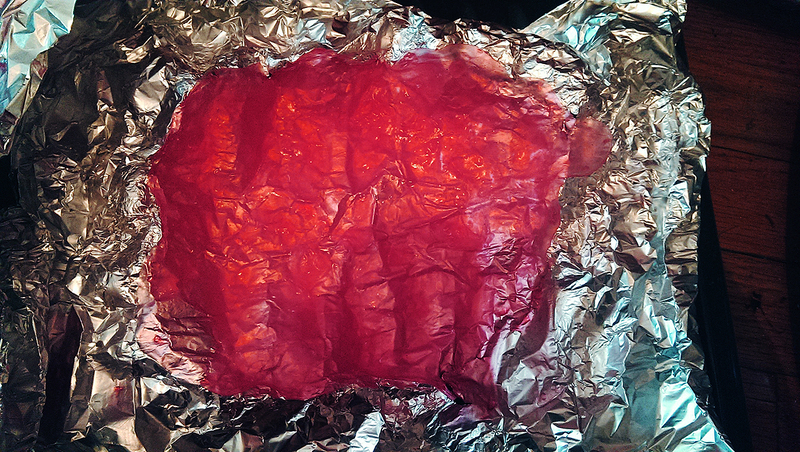 After 3 hours, it was jelly-like, moist, translucent and rather pliable. Definitely turned out more like my initial experiments than the liquid batches above. I decided to try one more batch that was a bit more creative though. I read online that the inside translucent film of egg shells have been used – their extracted protein at least – to make bioplastic. Obviously I didn’t have the resources to do that so I decided to just try… dumping in little bits of film from the inside of an egg. I added salt because in the Green Plastics book it said if you worked purely with starch the salt would help (somehow… I stopped paying attention when the scientific explanations started getting diagram-y). 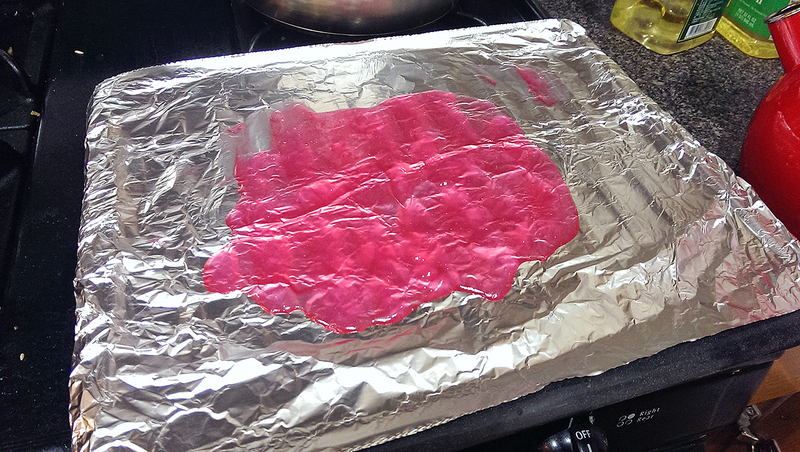 I added mica powder towards the end after simmering the solution on the stove because I thought – why not? I use a lot of mica powder to make a pearl-like finish on my polymer clay and I thought this would give the material an interesting sheen as well. Which it did. As you can see, after about four days the thin bits of film were totally dry but a lot of my plastic was still very moist. 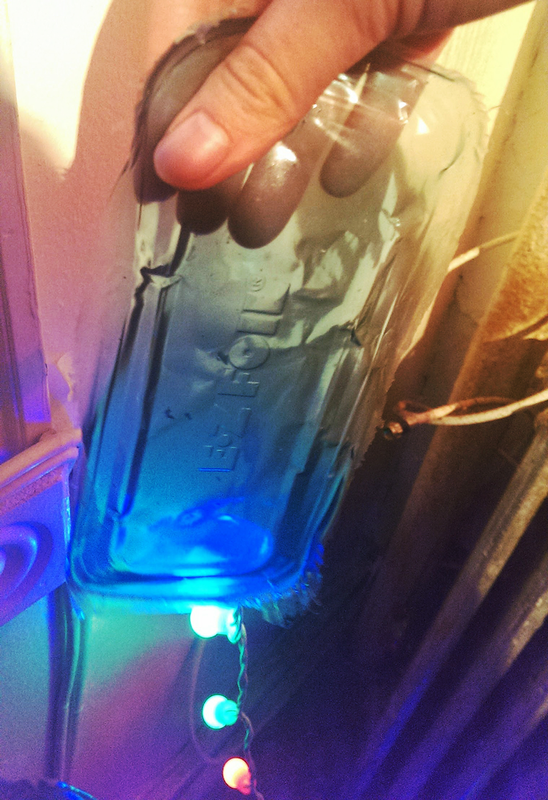 This led to mould appearing instantly around the fourth day and I had to keep picking it off (blargh). So bio-glass remains a future option to experiment with, possibly with a faster drying option like an alcohol bath or maybe even experimenting with tapioca starch/arrowroot/coffee as Karen was doing – as some of her experiments were pretty dry in a few hours. I managed to make actual fully transparent bits of pliable, flexible plastic, which is incredible. Also latex-like material of different colours. 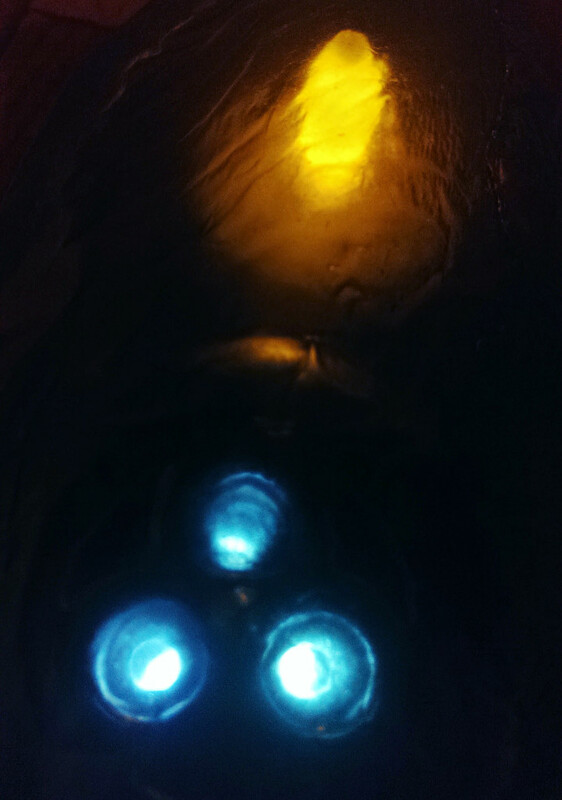 Adding green and blue food colouring together made a black piece of plastic which is super interesting. The most interesting pieces of plastic was the one I could peel perfectly from the aluminum foil (don’t use baking wrap unless you have some kind of release) and it imprinted words onto the plastic – so definite potential resin/imprinting abilities. And also the mica-powder experiment I did last because of the shimmer the mica powder gave it. 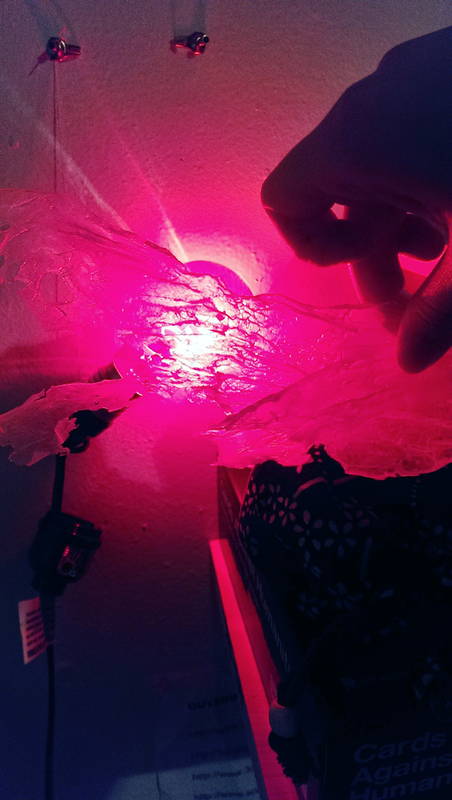 Overall, I can say my experiments were definitely successful to an extent and I have every expectation and intention of incorporating bioplastic fully into my artistic practice in the future as a bio-material to support my projection and video work and as an artistic medium of its own right. I will perfect my technique – towards the bio-future, as our computer overlords might say.